In his excellent 1999 novel Starfish, science fiction writer Peter Watts wrote about "cultured brains on a slab" - a "head cheese" - that could pilot a plane as well as a person. 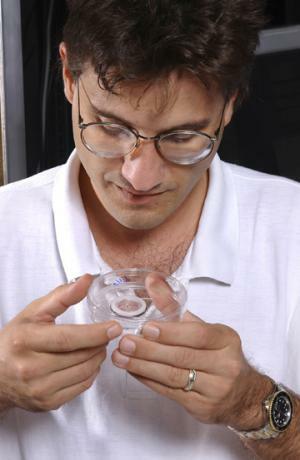 Now, University of Florida scientist Dr. Thomas DeMarse has created a "brain in a dish" that can interact with a computer flight simulation. The "brain" is a small puddle of 25,000 living neurons taken from a rat's brain and cultured in a glass dish. "It's essentially a dish with 60 electrodes arranged in a grid at the bottom," DeMarse said. "Over that we put the living cortical neurons from rats, which rapidly begin to reconnect themselves, forming a living neural network – a brain." The individual neurons are distributed randomly at the beginning of the experiment, and are not connected. The aircraft simulation of an F-22 fighter jet feeds data into the grid about flight conditions; whether the plane is flying straight and level or not. The neurons begin to organize themselves, forming connections to each other. The neurons analyze the data and respond by sending signals to the plane's controls. At first, the simulated plane drifts randomly. But the neural network slowly learns; currently, the brain can control the pitch and roll of the simulated craft in most weather conditions, including storms and hurricane-force winds. Read the original stories here and here. Read a short bio on Thomas DeMarse, Assistant Professor at the University of Florida's School of Biomedical Engineering.